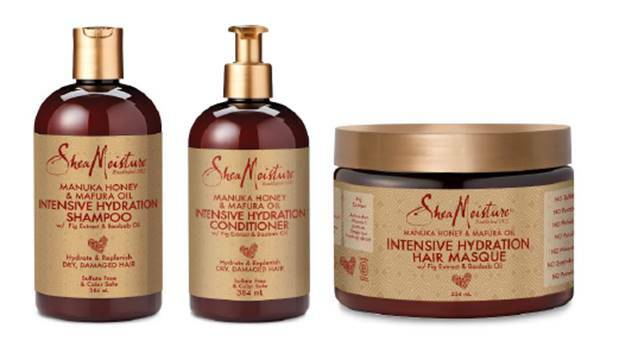 SheaMoisture has announced the UK launch of their newest collection, Manuka Honey & Mafura Oil. The Manuka Honey & Mafura Oil collection replenishes oils and provides a moisture barrier to protect hair and replenish dry, damaged and lackluster locks. The range is formulated with Manuka Honey, a natural humectant, Mafura Oil with essential fatty acids, Baobab Oil, and African Rock Fig rich in Vitamin C and antioxidants. The collection is available exclusively at Boots, priced at £12.99 per product. Manuka Honey & Mafura Oil Intensive Hydration Shampoo, £12.99, Boots – This sulphate-free shampoo gently cleanses, while infusing hair with intense moisture and shine-enhancing nutrients. Manuka Honey & Mafura Oil Intensive Hydration Conditioner, £12.99, Boots – This rinse-out conditioner instantly detangles and hydrates, while leaving hair shiny and more manageable. Manuka Honey & Mafura Oil Intensive Hydration Masque, £12.99, Boots – An intensive, deep treatment conditioning treatment that bathes hair in moisture and nutrients. Smoothes and fortifies follicles for stronger, healthier, frizz-free hair. Manuka Honey – Acts as a humectant, bringing moisture to dry hair. Mafura Oil – Provides natural damage control, while softening and promoting healthy hair. As with all SheaMoisture products, the Manuka Honey and Mafura Oil collection is colour-safe and cruelty-free, and do not contain parabens, sulphates, phthalates, mineral oil, gluten, synthetic fragrance or artificial color. Not only is the range a hair delight, it also fights to banish poverty. Certified organic Shea Butter in the collection is soured from 15 women’s co-ops in Northern Ghana through SheaMoisture’s purpose-driven Community Commerce business model, and 10% of the sales support investments in these communities. An ethical wage premium is paid co-ops members, and the brand aids in monitoring practices to ensure that the efficiency, health, profitability and quality of life is elevated for members of the co-ops.